Be the first to share your favorite memory, photo or story of Ms. Ann. This memorial page is dedicated for family, friends and future generations to celebrate the life of their loved one. 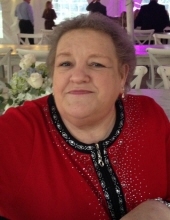 Ms. Ann Grover, 63, of North Augusta, SC and a lifelong resident of Aiken County, entered into rest on Thursday, April 4, 2019. She was the daughter of the late Marvin and Pansy Herron Grover. Ann worked for Southern Felt Company for the past 27 years and was a former employee of John P. King Mfg. Co.
She enjoyed gardening, was a wonderful caregiver, a faithful friend and encourager, loving sister and aunt, and taking trips to the Smokey Mountains. She will be greatly missed by each member of her family who loved her very much. In addition to her parents, family members includeher brother, Danny and Annette Grover, sister Brenda and Lee Benson, nephews, Darryl and Susan Grover, Michael Benson, and Chris and April Benson. Her great nephews Taylor and Emily Grover, Austin Henry, Tommie Henry, Christian Benson, and Reese Benson. Her great nieces, Jessica and Jon Johnson and Shelby Benson. Great-great nephew Gaven Gibson and great-great niece Layla Johnson. The family will greet friends on Saturday, April 06, 2019, beginning at 5 o’clock until 7 o’clock at Bethel Baptist Church, 1127 Bethel Church Road, Aiken, SC 29801. A Celebration of Life Service will be Sunday, April 07, 2019, at Bethel Baptist Church at 3:30 PM. Serving as pallbearers Darryl Grover, Michael Benson, Chris Benson, Austin Henry, Tommie Henry, Christian Benson, and Reese Benson. Brancie Stephens will be officiating. Interment will follow at Aiken Memorial Gardens. Please visit www.hatcherfuneralhome.comto leave a message of condolence for the family. To send flowers or a remembrance gift to the family of Ms. Ann Grover, please visit our Tribute Store. "Email Address" would like to share the life celebration of Ms. Ann Grover. Click on the "link" to go to share a favorite memory or leave a condolence message for the family.